It is not an Easter basket if there is no chocolate bunny in it. But that is just our position! The Easter basket tradition traces its roots back to ancient Germanic celebrations. Spring was a time of renewal and replenishment and feasts marking the equinox were common. First of all, the tradition is said to have arrived in America in the 1700’s. It came over with German immigrants who settled in Pennsylvania. Moreover, the tradition of an egg-laying hare called “Osterhase” or “Oschter Haws” was popular. For example, children made nests in which this creature could lay its colored eggs. Bingo! Finally, the Easter basket had found its way to the New World. 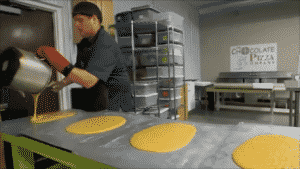 Easter is a busy holiday for Chocolate Pizza Company. But it is easy to see why. Our chocolatiers create bright, exciting Chocolate Pizzas in soft pastel colors. There is the Celebrate Spring Chocolate Pizza with its rich milk chocolate blended with homemade English toffee and topped with pastel chocolate. Finally, to sweeten those Easter wishes, make it a Chocolate Pizza. We use milk or dark chocolate with a pastel candy border. “Happy Easter” is scripted in white chocolate. The most popular Easter Basket in the line-up is the Easter Egg Basket. Certainly, the 6-ounce chocolate egg is the star of the show. Gourmet milk or dark chocolate with beautiful swirls of pastel colors create a one-of-a-kind Easter treat. But don’t overlook the famous Peanut Butter Wings in this basket. Crisp, rippled potato chips covered in creamy peanut butter and drenched in milk or dark chocolate. They are simply amazing. Marshmallow Peeps are an Easter tradition in many homes. 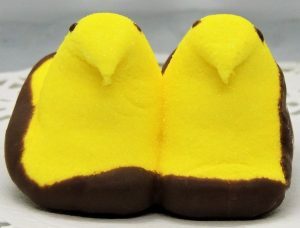 We take a pair of these squishy, yummy brightly colored birds and dip them in chocolate. The result is an irresistible combination of marshmallow and chocolate. But that is just the beginning of the sweet surprises our chocolatiers make. The company’s website has all their delicious specialties. There are a few things that separate Chocolate Pizza Company from other chocolate makers. They use the highest quality Swiss-style chocolate for starters. Chocolatiers carefully temper the chocolate. This manipulates the temperature during melting. The result is strength, shine and a velvety smooth mouth feel that elevates our chocolate. Finally, they add a unique twist – homemade English toffee. The toffee is made on-site in small batches. The toffee is poured, cooled, stretched and ground fine. Subsequently, the toffee is blended into the chocolate. Chocolate Pizza Company is Central New York’s largest chocolate maker. Consequently, the company has been featured on Food Network, Hallmark Channel, CNBC and more. As a result, owner, Ryan Novak, has been interviewed by Forbes and People magazines. 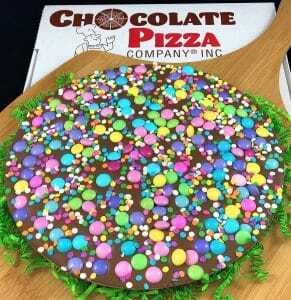 Located near Syracuse, Chocolate Pizza Company ships nationwide. Also, its website has received orders from chocolate lovers on six continents.